Please stand clear of our #DisneySide @Home Celebration! 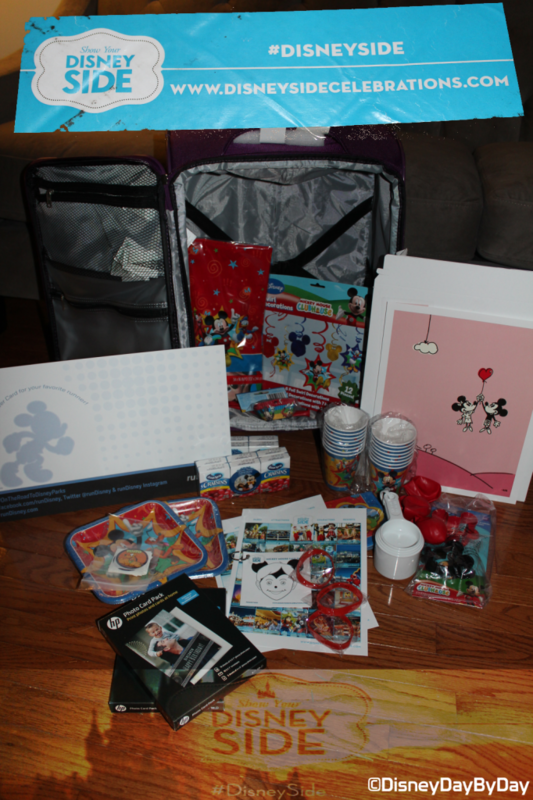 Note: I received free products in order to host the Disney Side @Home Celebration. The opinions expressed here are my own, I promise. We’re having a party!! Walt Disney World is going to party all year long… Come on everybody, jump into the beat and put your hands up…. Havin a party…. How many of you remember that song from the Walt Disney World 15 Years of Magic parade. That song has stuck in my head for many years, so anytime I have a party I have to bring it out. I might not have all the lyrics right, but it’s still fun. So, yes, we’re having a party, come on everybody jump into the beat and put your hands up…. 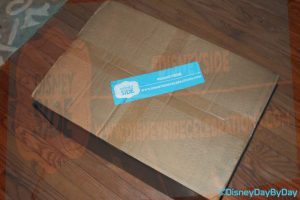 I can’t wait to share all our party pictures with everyone, but first here is the package that arrived to wake up our #DisneySide and help plan our celebration. As we opened the box we were excited to see all of our celebration supplies packed nicely in an American Tourister DeLITE Spinner. Yes, it’s purple… I know. But I’m man enough to show my purple DisneySide and I will definitely use this for our trip to Disney next month. Did you know that American Tourister is the Official Luggage of Walt Disney World and Disneyland resorts? One of the highlights of this suitcase is that its weight is only 8.4 lbs. 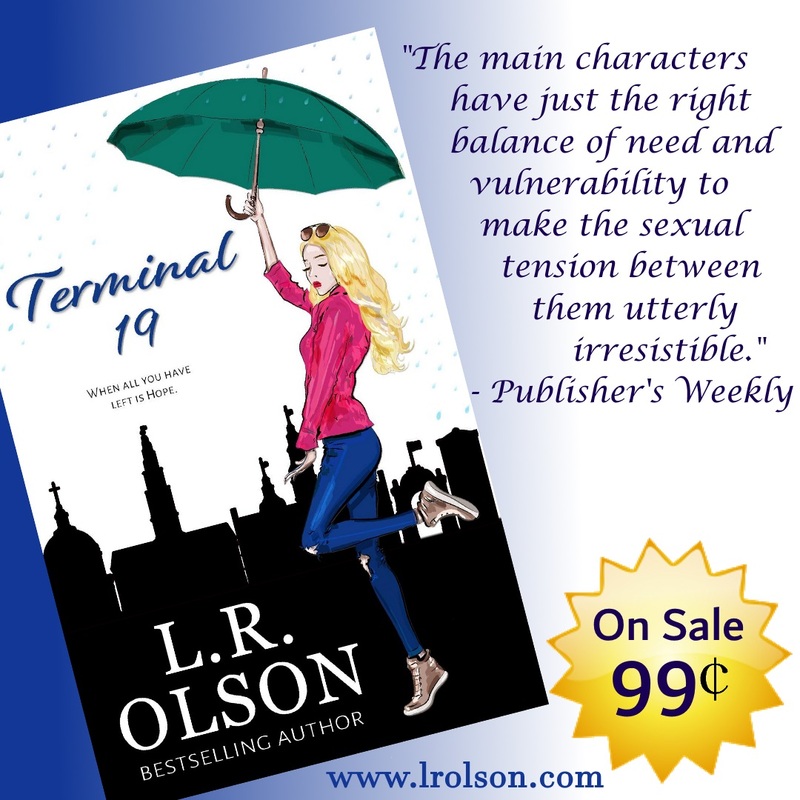 Of course this will help with all the increased baggage fees that continue to rise. But don’t let the light-weight fool you. 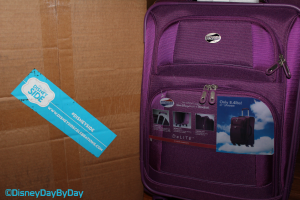 This luggage is sturdy, and made with high quality materials. I’ll let you know how it holds up on upcoming trips. I know we were as excited to you to find out what was inside. We want to get planning!! It’s a lot to take in, I know. As we began to explore the kit, our excitement built and we started to dream about our party theme. In the kit you’ll find everything you need to plan your party. Just add people, food, and your own bit of pixie dust. Here are more details on what we found inside…. 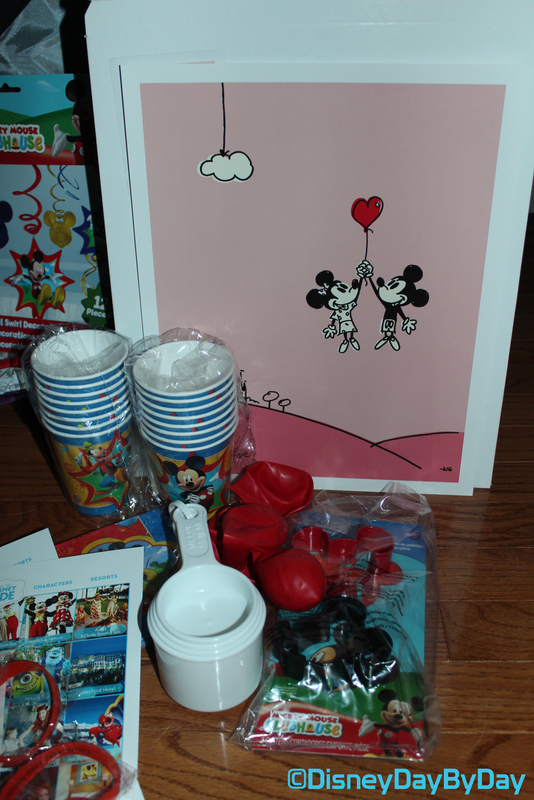 Mickey Mouse Clubhouse party supplies, including swirl decorations, cups, plates, tablecloth, and cupcake holders. Looks like someone will be having cupcakes at their party. Also included were measuring cups, cookie cutters, and recipe cards to help you whip something up for the party, or to include in baking activity. The picture below called “So this is Love” by Will Gay (creative director at Disney’s Yellow Shoes) was also part of the package. We love the print and can’t wait to give them to our guests! 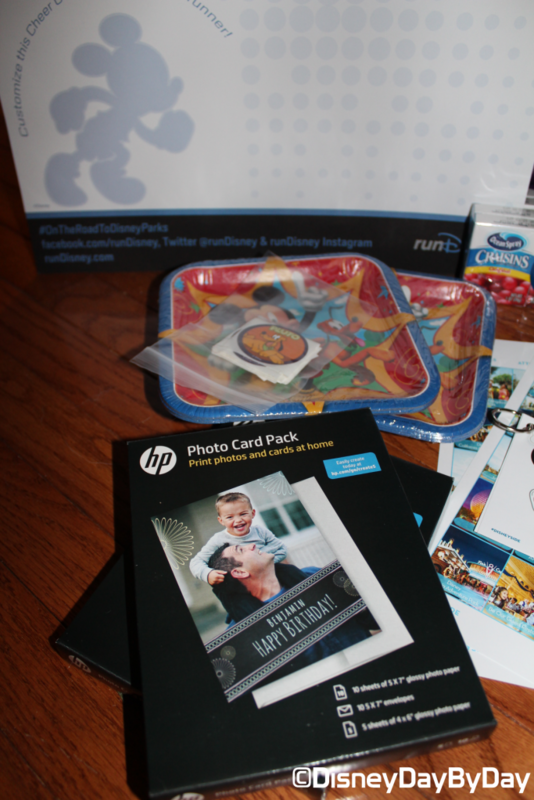 The kit also included RunDisney Cheer cards, Craisins from Ocean Spray , and HP Photo Card pack… which we plan to use for our invitations and as party mementos. Disney stickers, tattoos and bingo cards can also be seen in the photo below. But that’s not all! 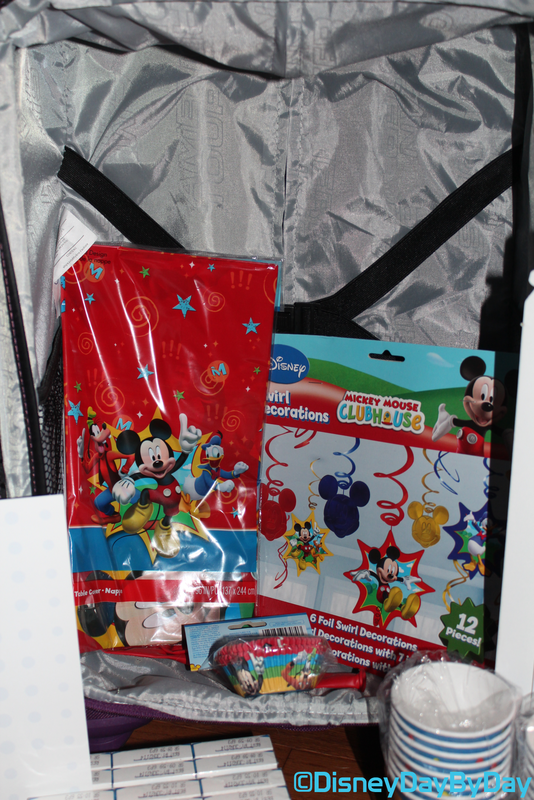 The package also includes a few recipe cards, RunDisney decals and bracelets, and finally… Disney trivia cards! We would like to thank all the amazing people at #DisneySide who have allowed us to have this opportunity and the wonderful sponsors HP, American Tourister, and Ocean Spray! Of course we can’t forget to thank Disney! I think it’s so cute that you got the purple suitcase! That’s the one I got too. 🙂 I love it. It’s the perfect size for several nights away. And it’s a carry-on! SCORE! I bet your party will be tons of fun! Can’t wait to read about your party details! That’s a lot of loot!